Dimensions: 9 x 8-1/4 in. 144 pages. Nothing says home sweet home like the aroma of a freshly baked pie. 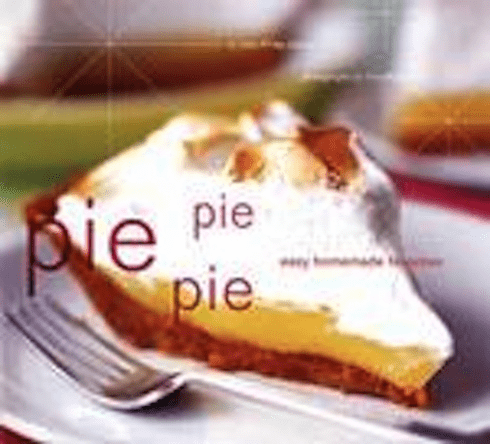 And with the voice of an old friend, author John Phillip Carroll teaches foolproof methods for making the delicious tried-and-true favorites that top every pie lover's list, plus some exciting new flavor sensations. The buttery golden streusel on the Apricot Crumble Pie will give Grandma's a run for her money. For a new twist on an old classic, drop a fork in a chilled slice of Butterscotch Cream Quince Pie with its spicy gingersnap crust. Fudge Brownie Pie takes the cake as a hip new treat for a kid's birthday party. Recipes for seven different types of crust ('cause one just isn't enough) plus simple toppings like meringue and chocolate fudge sauce ensure that each pie is perfect, from bottom to top. Apple or Key Lime, Caramel Custard or Mile-High Strawberry -they're all as easy as Pie Pie Pie.